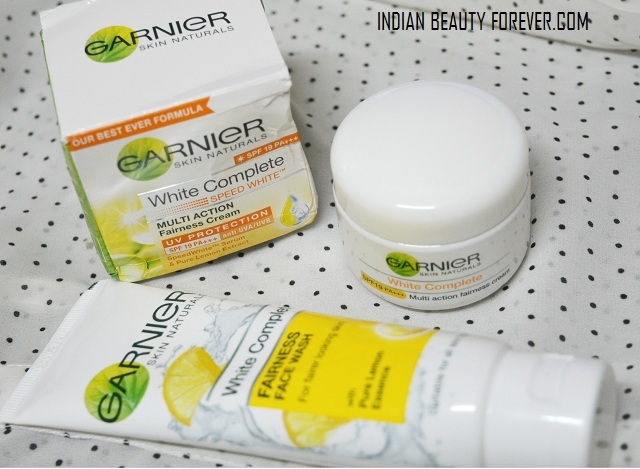 I will review Garnier white complete fairness cream and the fairness face wash. These two products have been used by me some time back but these are the new and improved versions I think as the fairness cream has the speed whitening serum with the lemon essence. 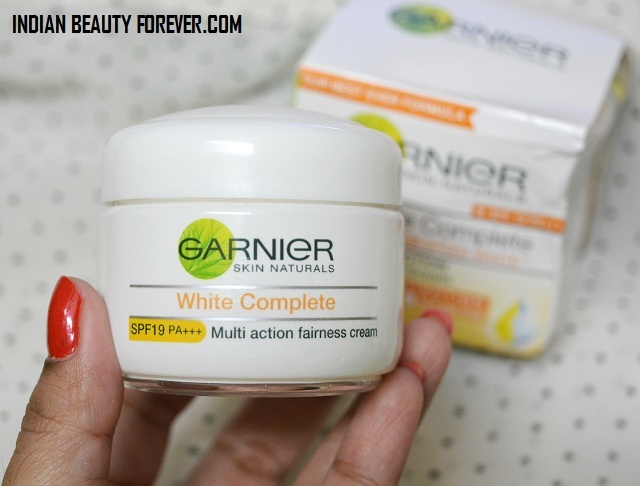 But this is not just a review but you can also get a FREE sample of Garnier white complete fairness cream for yourself and take the 7 day challenge. Price: Garnier white complete fairness cream is for 160 for 50 g.
Garnier white complete fairness face wash is for 145 rupees for 100g and 80 Rs for 50 g tube pack. The cream is whitish coloredwhich is not too thick and gets very easily absorbed in the skin. The good thing is that it will not leave a white residue on the face or will give a stretchy feeling. I also like that the cream blends extremely easy on the face and once it blends into the skin it leaves a very soft and velvety feel on the face. This is good for the oily skinned people as the oily skin already have overactive sebaceous glands and when a skin cream is greasy then the oils will be lot more. 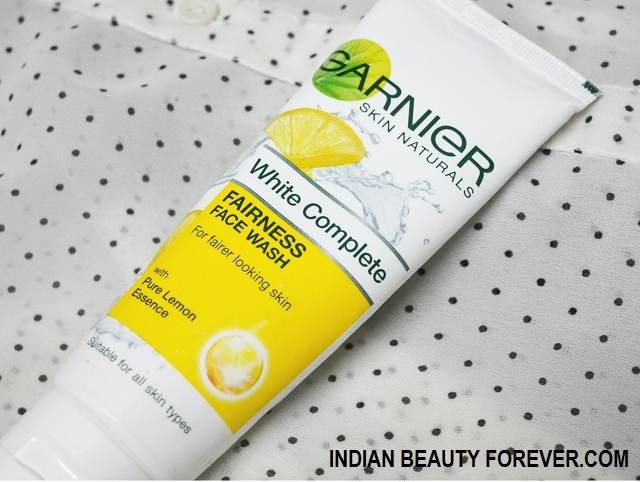 Garnier White complete fairness cream gives a slightly fairer looking skin with no oiliness. But this will not control the oils hence my skin starts to get oily on the T Zone after 2-3 hours which I am okay as rarely creams can control oils. The SPF 19 is good as I am someone how will ignore the sunscreen even though knowing how important sunscreens are so, when a day cream has SPF then this is like a bonus. I am using this cream every day now for the past 2 weeks and love the way it makes my skin look. Another important thing is that this gives no ashyness or white cast on my face. The face wash is a creamy white slightly on the thicker side facial cleanser. This cleans the face thoroughly by taking off the makeup residue, oils, sebum and other skin impurities. I would just need a little dot of this and I am good to go. This tube pack will last really long since the product used is very less to get a squeaky clean face. My face looks radiant and bright after using this. There is no stretchiness or oilyness. I am using it twice in a day. Morning and evening. This has not break me out or given any other skin problem. I like the way it makes the skin fresh as you know in summers, oily skin looks slightly darker and dull, so I will recommend this facial cleanser to the teenagers and people with oily to normal skin. Rating: 4 out of 5 for both the products. Now, it’s time to take the 7 Day Garnier Challenge. You can get a FREE sample of Garnier white complete fairness cream by registering yourself by filling this registration form http://7daygarnierchallenge.com/ and Garnier India will send you the sample. Garnier will then deliver the sample to your postal address. If you get lucky then you can also win a Garnier Gift Hamper. So, go ahead and register your details at the link provided above.